Bob Cousy is 90 years old. He lives alone in the same house in Worcester that he’s occupied for decades. His wife has passed away, his kids are grown – he’s left to live a largely solitary life, one in which he looks back at his hardwood past. There are awards and trophies, plaudits and championships – he has few regrets. Just one, really. Bill Russell. Cousy was a superstar before he set foot on the floor at the Boston Garden. His flashy, improvisational style of play helped propel his collegiate team at Holy Cross to unprecedented heights, with NCAA tournament berths and three All-American nods. But it was when he landed in the still-nascent NBA in 1950 that he truly carved his name into the history books. Quickly dubbed “The Houdini of the Hardwood,” Cousy became one of the biggest stars in the league. Over the course of his 13-year career, he led the league in assists eight times and was named MVP in 1957. He was named All-NBA a dozen times and was voted an All-Star every year of his career. However, it was only when a defensive dynamo from the University of San Francisco arrived that the titles started coming. Cousy would win six titles alongside Russell, who would in turn win five more following Cousy’s departure. Between Cousy’s energetic offensive skills and Russell’s unmatched rebounding and defense, the Celtics of that era were simply unstoppable. But it was only in the years after they parted ways – many years, really – that Cousy began to wonder why his relationship with his old teammate wasn’t what it was with some of the other guys from those days. 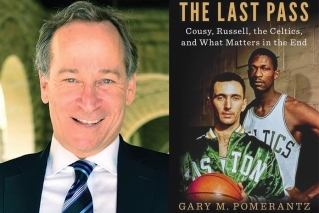 After some soul-searching and self-examination, Cousy started questioning whether he had done enough to help Russell deal with the societal racism that confronted him every single day. To many, those Celtics teams belonged to Cousy, not Russell. And while one could make an informed argument, the truth was that that opinion sprang from one simple fact: Cousy was white, Russell black. While they were mostly equals on the court, they were far from it anywhere else. As the civil rights movement gained steam – and Russell became more involved – Cousy never truly grasped just how much the country’s ugliness hurt his teammate. As both men approach the end, Cousy seeks to make amends, or at least to acknowledge to his old friend that he regrets not doing more. “The Last Pass” offers a compelling portrait of one of the greatest players in NBA history. The early days of the league bear only a passing resemblance to the multi-billion-dollar industry we see today, but Cousy’s place in the game’s history remains unassailable. Getting a sense of those differences – brawls on the court, cigarettes at halftime, teams in isolated small-town outposts – makes for fascinating reading. What Pomerantz has done is mine Cousy’s story thoroughly and meticulously; these interviews unfolded over the course of years, allowing for a degree of detail and nuance that borders on the staggering. The reader genuinely gets to know Cousy – both the player and the man. That’s a real rarity in any book, let alone what is ostensibly a sports biography. But of course, it’s more than your standard sports book. No hagiography, “The Last Pass” uses Cousy’s story to reach deep into the fabric of the culture itself. The nascent NBA is used as a lens to view larger truths about mid-century American society. Cousy’s desperate yearning to set things right with Russell is a reflection of a country that still struggles to come to terms with the sins of years gone by. Cousy was known for his ability to get his teammates the ball, but in “The Last Pass,” it’s Pomerantz who dishes the assist, allowing the Houdini of the Hardwood to score once again.